Pepe’s Wharf may be the loveliest and most inviting of all of Provincetown’s little waterside shopping and dining enclaves — the Mews, Angels’ Landing, Designers’ Dock — thanks to its entrance portal, multiple levels, lush plantings and numerous corners, around which the passageway down to the restaurant and the beach keeps unfolding. It was developed in 1966 by Nils W. Berg (d 1994) and Eva (Kaye) Berg (1920-2009), just four years after Nicholas and Ray Wells had developed the Mews, at 359 Commercial Street. And the property is still in the hands of the Berg family, almost a half century later. “Pepe,” incidentally, seems to have been the nickname of the Bergs’ son Nils (b ±1955). The double-width lot that makes such an enclave possible has existed for more than a century, at least. It was the property in the early 20th century of Capt. Robert M. Lavender, whose home is now the Waterford Inn, at 386 Commercial Street. Then it was acquired by the abutting Provincetown Cold Storage Company and apparently used for some time as part of that operation. After Provincetown Cold Storage shut down their Johnson Street freezer, they sold this parcel to National Trap in 1950. National Trap sold it to George F. Miller Jr. in 1953 and he sold it to the Bergs in 1965. Eva Kaye began coming to town in the 1940s. Beata Cook, a Provincetown resident and friend of Kaye’s from Bridgewater Teachers College, introduced her to Hilda and Pat Patrick of the Flagship, where she worked for several summers. In 1951, the Patricks introduced Kaye to Nils Berg. They had married in a matter of months. The eastern of the two buildings facing Commercial Street, which now houses Kelly Blake’s Go Fish clothing store, was once the Provincetown Art Shop. J. C. Herring was the proprietor in the 1920s. By the early 1960s, the 371 Gallery was also here. The Bergs remade the buildings into a complex that they first called the Wharf of the Seven Oars. Among the early shops in the complex were Indian Silks Unlimited, run by Stuart and Ann Phelps, and Mooncussers-The Man’s Boutique, which noted the arrival in 1966 of “Tom Jones Shirts” — a terrifying concept. Another early retailer in the Go Fish space was David’s Place, a clothing and jewelry store. Pepe’s restaurant, which opened in 1967, was always the centerpiece of the ensemble. The legendary Howard Mitcham was at one time the head chef. Among the dishes with which he was credited were the amêijoas na cataplana. “This deceptively simple, yet elegant feast of clams, flavored with linguiça, chouriço and fresh aromatic vegetables is one dish making Pepe’s Wharf one of Provincetown’s premier restaurants,” Mary-Jo Avellar wrote in Provincetown Portuguese Cookbook (1997). The Bergs’ daughter, Astrid Karinna Berg, who is now [?] the executive chef, was graduated from the Culinary Institute of America. Besides the restaurant and Go Fish store, other current tenants are the Bowersock Gallery, founded in 2004 and run by Steve Bowersock and Michael Senger, which represents painters, sculptors and other artists, 30 in all, here and in Mount Dora, Fla. Lynn Cichetti also runs the Under Glass framing shop here. 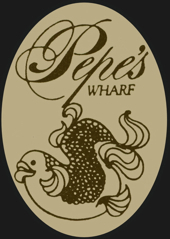 Pepe’s wharf — during the 1940’s — was known by the locals as Nonny’s Wharf. There was a telephone pole standing upright on the corner of the wharf, on the Johnson Street parking lot side. Fishermen used that pole to load trap poles. Teams of horses pulled a line around a capstan, up through block ‘tackle at the top of the pole. The poles were placed on a barge and taken out to the weirs. Johnson Street parking lot was where the cold storage, freezer plant, sat. It was torn down in the early 1950’s. Nonny’s pier was not as big as the Miller wharf, which stuck out further into the harbor. Remnants of Nonny’s are still visible. Nonny’s, now called Pepe’s, had a trap shed on the end where weir fishermen stored gear. Local kids would jump from Nonny’s wharf at high tide and hang out underneath at low tide. Pepe’s is now a beautiful alley with lots of character, shops and, of course, the Restaurant. Dutra is the author of Nautical Twilight.